The Dino-Lite Premier AM5116T views in sharp 720p resolution with the convenience of connecting directly to a VGA monitor. It requires only a readily available monitor with analog D-SUB interface for applications such as in inspection, presentation, and training. That makes it useful in an assembly line, workshop, laboratory, store, and more. The AM5116T has the capability to freeze the live video to examine details with a simple tap of its MicroTouch. The LEDs can also be switched by tap and holding the same MicroTouch for two seconds. The AM5116T can magnify from 20x to 50x depending on distance and achieve additional 200x when at close range. 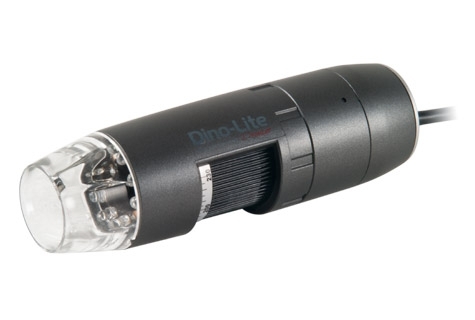 The position of the Dino-Lite knob can also be locked if intended.